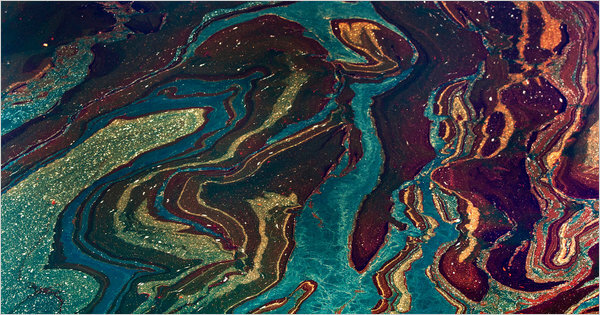 The oil spill in the Gulf of Mexico is nothing but a plain disaster. It was of course a topic at ESA's Living Planet Symposium in Bergen this week, where use of satellites to help mitigate this environmental - and economic - disaster was on the agenda. But this is not about the science nor the politics of the oil spill. NASA has made a collection of their satellite images that I regularly check out on their website (click on above image to get there). And I cannot help but to find some of the images really beautiful. Inspired by an article I read in New York Times that used an image of the oil spill off the coast of Alabama that looked pretty awesome, I decided to waste some time playing with NASA satellite images using GIMP. Just for fun. Before i show you the blue versions, here is the 'oil industry in the US is OLD' kind of look where I enhanced the contrasts. Like I said, there is no science in this. Just looking at the disaster from a different perspective.